We work for the BEST beer in town! 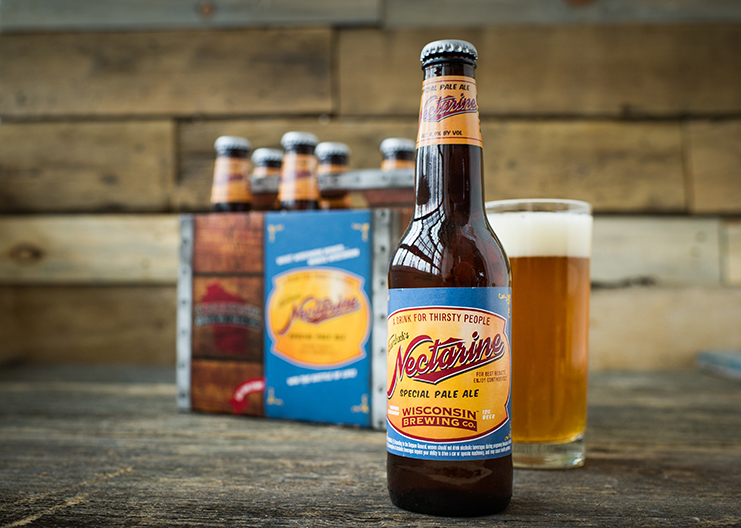 Working for beer is a fun gig and designing a classic label like the one for Nectarine is a special treat. The beer name goes back to 1898, when the Fauerbach Brewing Company was a brewing gem on Lake Monona in Madison Wisconsin. The Wisconsin Brewing Company has reimagined the brew using the classic name and created a delightful beer. It’s easy to drink and has lots of citrus flavor that you’ll enjoy this summer and beyond. Hand-drawing the Nectarine typeface and finding typefaces to compliment the classic style was a type nerd dream come true. We had a blast mocking up all the possible styles and combinations of silly sayings till we landed on the perfect one. “For best results, enjoy continuously!” Cheers! That hand drawn Nectarine looks amazeballs!